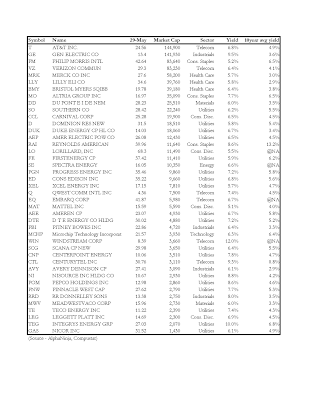 AlphaNinja - Below are some of the highest dividend yields in the S&P500. I excluded financials, as well as some that are all but guaranteed to cut those payouts. 18 of the 42 below are utilities, yielding on average 7.1%, a full 200 basis points above their 10year average. These are yielding so high thanks to heavy debt loads and worries about damaging cap-and-trade costs in the future.